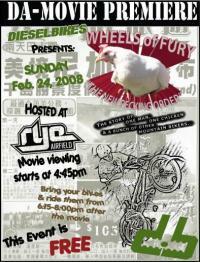 Wheels of Fury "The New Pecking Order"
Check out some film footage from our first movie premiere held at Rye Airfield in Rye, NH. We have a few after movie interviews getting each person's opinion regarding our release. 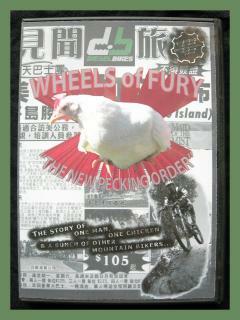 Wheels of Fury �The New Pecking Order� is a departure from our past local movies. This movie is really two movies interlaced with each other and contains a story plot that will make you laugh. Filmed with cheesy cameras and sub-par special effects, this movie will motivate you to ride as well ask; �what were these people smoking to make this movie�? This movie features 8 character actors and over 30 local mountain bikers having fun on some of New England's best trails. Filmed throughout 2007 this movie features music by local New England band giving you the feel and flow of what each trail offers.